What are the primary barriers to mass-adoption that apps face, and how can they evolve to overcome them? In "Will Apps Forever Transform Advertising as We Know it?" I argued that specialized applications, accessed through our smartphones, tablets, computers, and even TVs, are having a significant impact on the ways in which consumers are consuming content - which, as a result, impacts how advertisers are engaging them with their brands. A recent article in The Globe and Mail, however, points out that this shift will be slow moving until apps evolve to overcome several barriers to adoption by the masses (other than availability/costs). In this post I'll take a look at what those barriers are (according to the article) and how apps might change in order to address them. Barrier 1: The relatively low standards for app development have led to marketplace clutter. “This isn’t the Wild West Internet. People need to be able to find these things. If there’s a lot of garbage, it makes it harder for everyone,” Mr. Michaels says. If you’re trying to find a particular GPS driving app but aren’t sure of the exact name, you could spend hours browsing before you find it. A fair comment. 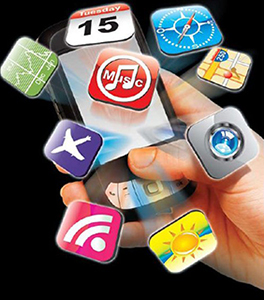 Currently, word-of-mouth seems to be the primary way in which people are learning about what apps to download. A friend raves about their latest find, lets you demo it on their phone, and convinces you to try it out for yourself. It's very difficult to discover new and useful apps organically. App marketplaces can be overwhelming, teeming with thousands of choices. It ends up being a process of trial and error - download something that looks interesting, spend a few moments trying it out, and if it doesn't look worth your while... delete it. This barrier highlights the continued relevance of traditional marketing to spread the word about an app that a brand has developed. Imagine entire ad campaigns that aim to drive awareness and downloads of an app. The other solution to breaking through the clutter is better functionality for recommending an app you're using to friends - in short, apps will have to become more social. But more on that below! Barrier 2: The app model runs counter to how we think about software. We’ve gravitated toward the cloud-based model of computing: we’re storing more of our data and carrying out operations (such as sending e-mails or creating spreadsheets through Google Docs) on remote servers that we can access anywhere. This movement is fuelled by a need for data portability, but also the way we’ve streamlined our collections of software. (And those “Install this update to get version 2.1.4 of program you barely use” alerts are also pretty irritating). Getting guaranteed value out of an app is a complete gamble. More than half of users surveyed by Nielsen say they’ve deleted apps they’ve downloaded, most often because they weren’t useful. I agree that we're definitely moving towards the storing of information, files, and applications in the cloud versus on a hard drive. Although some smartphone-owners may pride themselves on the size of the app catalogue that they've managed to collect on their phone's flash drive, many of us are a bit more discerning when it comes to the number of apps that we keep on our phone on a permanent basis. Combined with a marketplace cluttered with choices that range in quality, the mindset towards cloud-based computing means apps will have to respond. One option is to give in to the trend and push for the development of web-based applications. These apps look, act, and feel just like a traditional smartphone app, only they operate solely within the confines of your phone's browser. Although web-based apps lose a lot of the functionality that native apps have (ie. integration with the rest of your phone, reminders, special features), for apps that are primarily based on sorting and serving up content from the Internet, a web-based platform may make more sense. There is less investment required from the user (no need to download anything or give up too much data) and the app only operates while you're on the site. For brands that struggle to get consumers to commit to downloading their app, it's a win. The other solution is to work on designing an app, from the ground up, to be integrated with the user's phone. If an app is developed to be a permanent resource for the user, something that they can come back to from time to time and get value from, they will be happy to have it on their phone. And once they're used to having it as one of their "go to" tools, the result is ongoing engagement with a brand. I already have a healthy relationship with The Score, Flixster, and the Yellow Pages, all thanks to their apps. Barrier 3: Apps don't let us browse and share. Let’s face it: we’re a society of DADD sufferers (that’s Digital Attention Deficit Disorder). We jump from a news feature on congenital heart failure to the PDF study it references to related stories from other sources. Most apps, in their very design, run counter to those instincts. They’re also inherently anti-social: there’s little opportunity to e-mail your friends links, see that magazine article shared on Facebook or to comment on content. On this point, I'd have to completely agree. so far, most apps have been designed from the ground up to be anti-social - they stream relevant content to the user in a way that allows them to receive the information as efficiently as possible. For the most part, it's one way communication. Contrast that with the web, where every piece of content - a video, news story, tweet, etc. - is instantly shareable with everyone. Not only is that content shareable, but it invites commentary, debates, dialogue, and discourse. Check out the comments section of a controversial news article or sports story and you'll see what I mean. Then there are the forums and chat rooms on just about every topic under the sun. The web is more of a community. Apps are more like personal tools. One development might change this: the rise of tablets. With larger screens and more of a laid-back consumption behaviour, tablets will allow apps to evolve to be more social. They allow for a much closer integration and interaction between apps and web browsers and, along with their larger-sized keyboards, will allow apps to better communicate and work within one's social network. What do you think about the evolution of apps? What are some other barriers to mass-adoption, and how must apps change in order to address them? Nice post - I often wonder if apps deserve all the hype that they get. A few thoughts to add. Despite all the buzz around smartphones, less than half of the working age population has them. An obvious limiting factor to the adoption of apps. Also, I find that the beauty of apps is their speed and ease on a smartphone when finding the same info through the browser might be a pain, but as tablets become more common there won't be the same barrier. I totally hear what you're saying. The question I always get back when discussing the possibility of developing an app is - "What's the smartphone penetration amongst our consumers???" It's a fair question, and to your point, mainstream audiences are still catching up. We're a long way away from mainstream Smartphone ownership. That said, if we look to the future, say one, two years down the line, it's definitely going to be an "app world". The rate of subscribers to 3G+ Smartphones has been skyrocketing over the last few years. It seems to only be a matter of time. I agree with you last point. As "info-gathering" in the living room via tablet devices becomes a lot more prevalent, apps will have to evolve to become more than just information-streaming tools. They'll have to become more social - allowing users to interact with each other more, as they already do on the web. They'll also have to offer unique interfaces and experience that a web browser just can't offer.